It’s amazing how a book can be such an inspiration and how fast can you learn to do right things only if you make some small notes and apply them in real life. 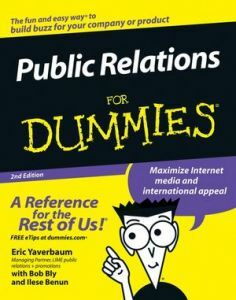 Of course, it’s again about “Public Relations for Dummies” 2nd edition. I also wrote here what I found interesting. Go to a toy store and look around. Can you create a game to publicize your message ? Keep a swipe file – a file of promotions that you especially like or that at least caught your eye. Use them for inspiration when planning your own PR. Ask employees for suggestions. Reward the best idea. Browse the library or bookstore. Or hang out at a museum. Inspiration often strikes in places where you’re surrounded by ideas. Look outside your industry. What is a common, successful promotion in one industry may be creatively copied and applied to your industry. Read literature on creative thinking. Keep a pad and a pen with you all the times to record thoughts as they occur to you. Whenever you write down a creative idea, drop it into a paper file or enter it into your computer. Keep a central idea file that you can dip into when you need a new creative inspiration. Hmm it seems like your site ate my first comment (it was extremely long) so I guess I’ll just sum it up what I submitted and say, I’m thoroughly enjoying your blog. I as well am an aspiring blog writer but I’m still new to everything. Do you have any recommendations for newbie blog writers? I’d really appreciate it. F*ckin’ remarkable things here. I’m really happy to find your content. Many thanks a lot and i am looking forward to contact you. Will you kindly drop me a email?